The record-breaking winter storm that hit the Deep South was especially harsh to residents of north Georgia, and turned the entire metro Atlanta road network into an immobile mass of gridlock. As of presstime, there are still countless drivers stranded in cars and students stuck in schools or on buses, where they've been since yesterday afternoon. Of all the reasons you don't want to ride out a winter storm stranded in your car, the most obvious is the danger of freezing to death. In an immobilized vehicle, running the engine to generate heat is a bad idea for two reasons: one, even with a full tank you'll run out of gas in a few hours, thus leaving you unable to move even when traffic does eventually clear out; and two, if falling or drifting snow or ice blocks your car's exhaust pipe, you and everybody with you could easily die of carbon monoxide poisoning. Tea light candles, or tea lights, are sold in disposable cups, usually made of metal. (They might also be sold under other names, including “potpourri candles”; what you're looking for is about the width of a votive candle, but less than an inch high.) The more upscale candle stores sometimes offer tea lights in glass cups, which definitely look more attractive than metal-cup lights. 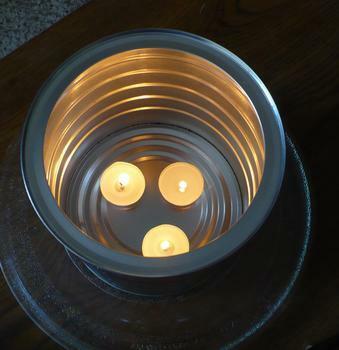 But for heating purposes you want to stick with metal-cup tea lights, for two reasons: they're cheaper than glass and, more importantly, metal transfers heat far more efficiently. The cheapest tea light candles I've found are sold in the candle sections of discount department stores for as little as four to five cents apiece (when you divide the number of candles by the cost of the bag or box). Such tea lights are usually plain white, and unscented. You can also find fancier colored candles in a variety of scents in various upscale stores, but these can cost well over a dollar apiece, which is far too expensive for heating purposes. 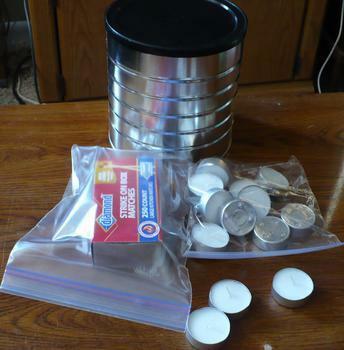 Once you have these items, turning the coffee can into a radiant space heater is simple: put the can on a stable, level, fire-resistant base where nobody is likely to knock it over, and burn three or four tea lights in the bottom of the can. Your average tea light burns about four hours before running out of wax, and the wick usually doesn't need to be cut or trimmed at all. By the way: if the wax candle falls out of its disposable cup, which often happens, make certain you put it back in the cup before you light it. A tea light candle, when lit, quickly melts into liquid wax, and without the cup to contain it, the wax will simply puddle all over the bottom of the coffee can, rather than be drawn up through the wick to feed the flame. I personally can vouch forthe effectiveness of coffee cans as radiant heaters – though, granted, in a well-insulated apartment rather than an un-insulated automobile. In October 2011, I was living in Connecticut when a monster blizzard knocked out the power to half the state. So I had no electricity and no heat; living in a hotel for the duration would've been monstrously expensive, but neither did I want to sleep in the emergency shelter the city set up in the middle-school gym. Fortunately, with coffee-can heaters sufficient to burn about 40 tea lights at a time, I was able to get my apartment's common areas up to 66 degrees at night, even as outdoor temperatures dropped to the high teens or low 20s. With four tea lights burning in a can, the heat rising out the top was so intense, I couldn't hold my hand directly above the coffee can without its getting scorched. Of course I never left a burning candle unattended, and extinguished all flames before going to bed (fully dressed) at night. But then, even with no heat at all, your average dwelling is a lot more survivable than a car stranded on a highway; if nothing else, you can put on extra layers of clothes, snuggle down beneath extra blankets and stay in bed until things warm up again. Which is why you need to add such things to your car's winter emergency kit: the space-heater setup I mentioned is only a start. You'll also want a warm blanket (or more than one, if you usually drive with passengers), a hat that can be pulled down low enough to also keep your ears warm, mittens or gloves and, ideally, a good scarf and an extra pair of warm socks, too. Pillows for everyone are not strictly necessary, but if you have the misfortune to sleep in your car they'll certainly make things less uncomfortable. 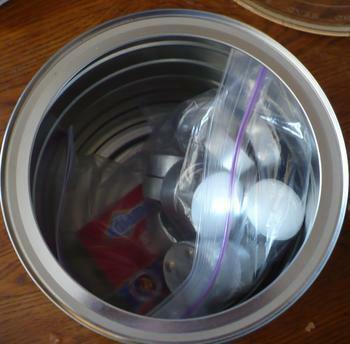 You'll also want some individually wrapped, high-calorie snacks, like granola or energy bars, because your body requires fuel to generate heat just as much as your coffee-can space heater does.